I’ve found that there are two components to creating the perfect steak. Where your meat is sourced from, and the marinade used. 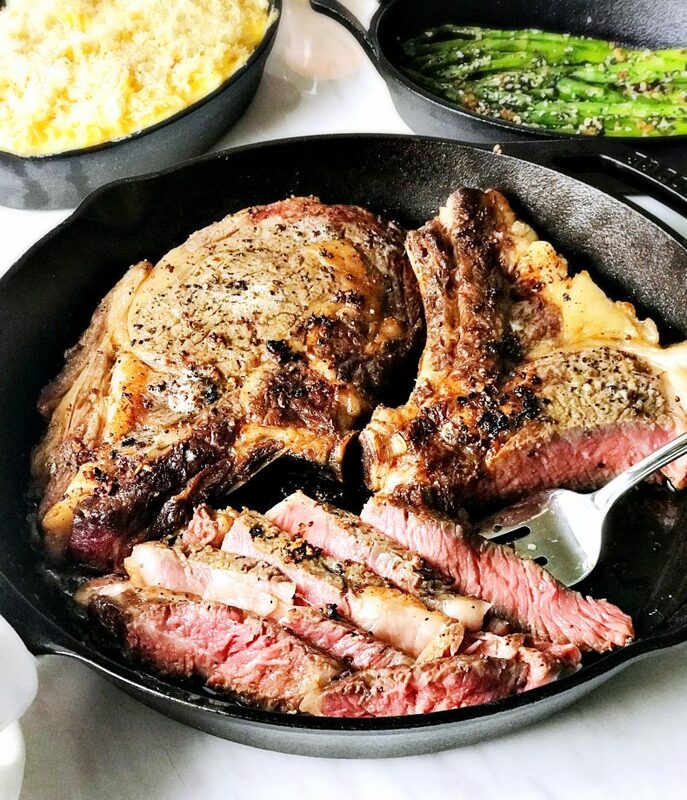 You can cook a steak on the grill, stovetop, or even in the oven and yield a good end result, but the taste is going to depend on those first two components. So let me give you the run down! 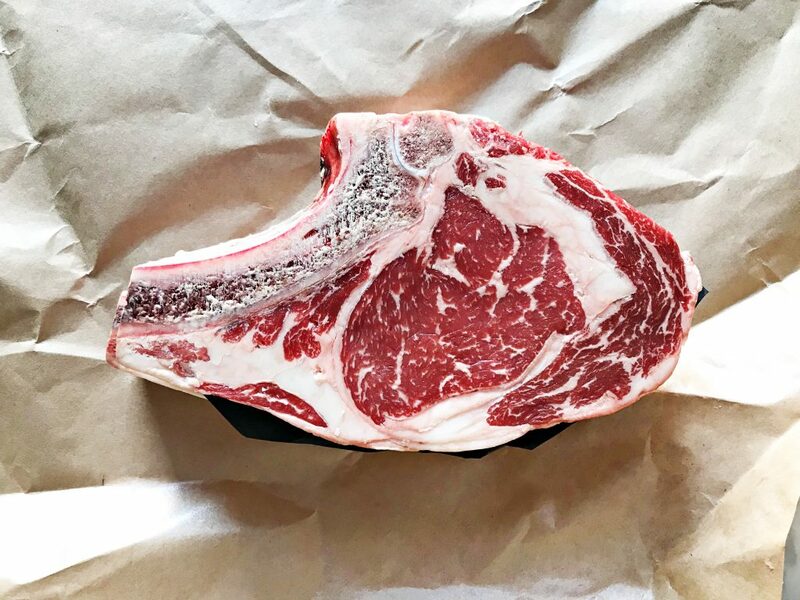 If you have access to a quality local butcher, USE THEM. Pay the little extra to get meat that is locally sourced, free of antibiotics and hormones, and isn’t produced for the sole purpose of feeding the masses. Here in Columbus, The Butcher and Grocer in Grandview, has become the only place I use as my source of steak. 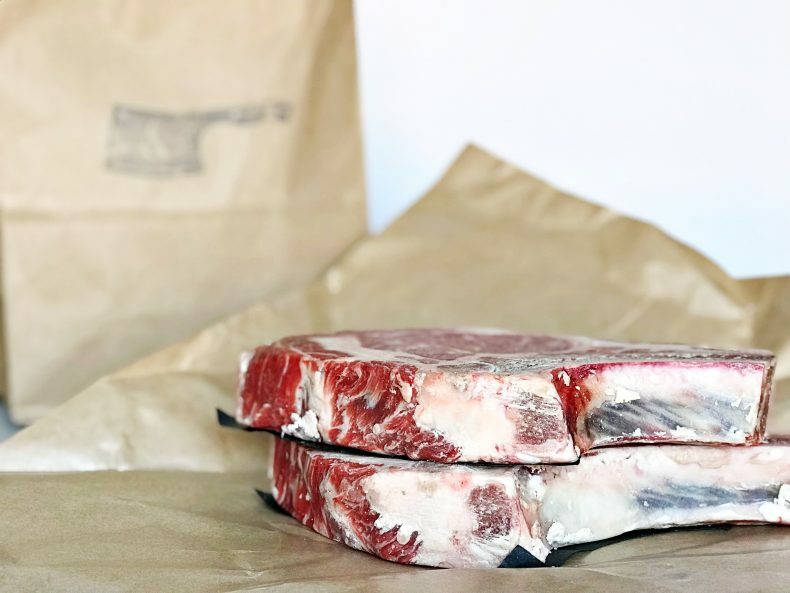 The Butcher and Grocer only source from Ohio, family-owned farms, and pride themselves on doing whole-animal butchery. Meaning, they never receive frozen, refrigerated, or pre-packaged meat. The animals are raised on pasture, fed a diet that nature intended, and when the time is right, they are humanely slaughtered and sent to the butcher whole. I cannot stress enough how much of a difference this makes in the end result of your steak. If you have access to a local butcher I would highly recommend giving them a try. If you don’t, try to get pasture-raised, organic, grass-fed beef. 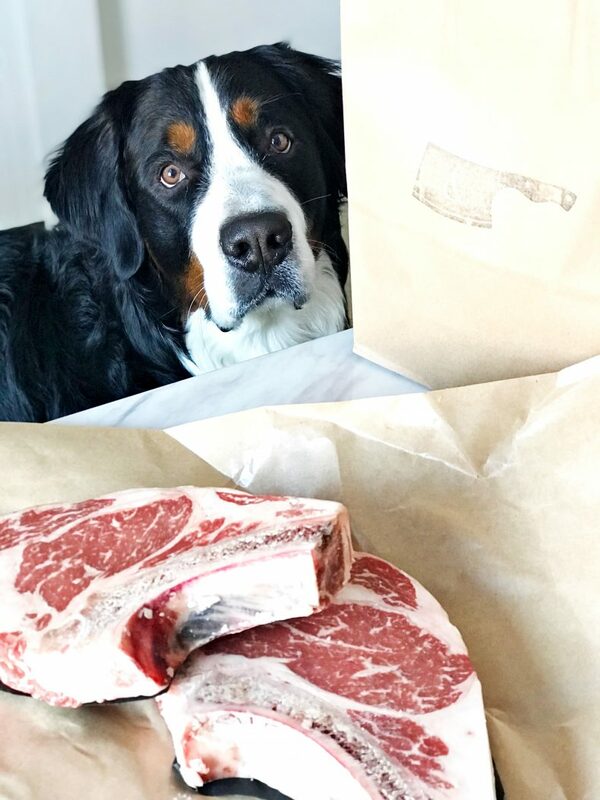 And if you live near Columbus, you need to check out The Butcher and Grocer! As if there’s not enough upside to buying meat from your butcher, you get to support local farmers too! Now this is where the magic happens! 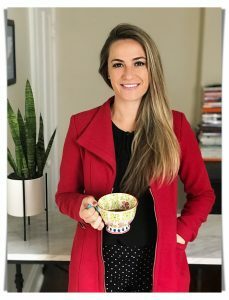 I have been using the same marinade for years, and I can’t stop because I don’t even want to try anything else! 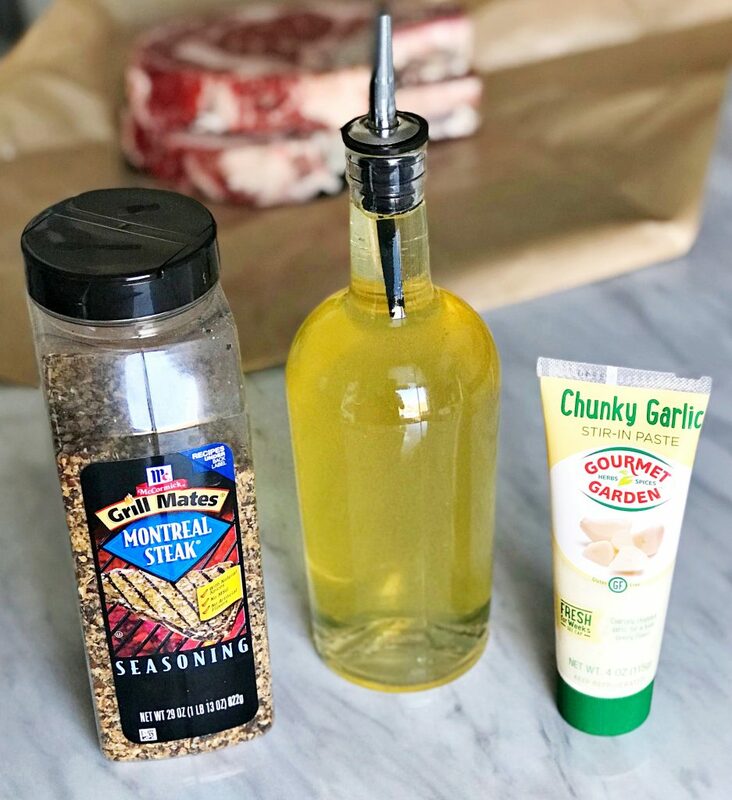 There are 3 simple ingredients you need for this marinade…oil, garlic paste, and Grill Mates Montreal Steak Seasoning. Start by pouring oil in a small bowl, and mixing in garlic paste. 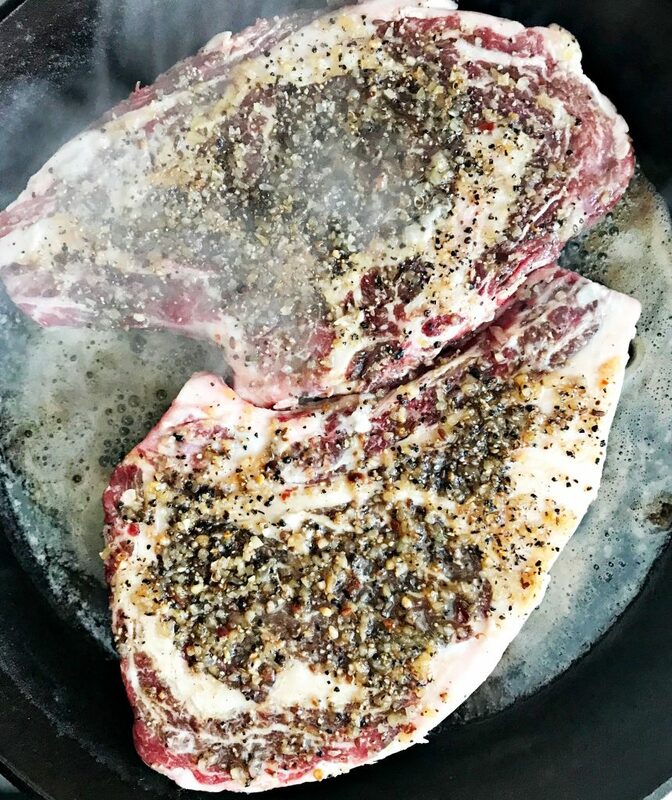 I use a brush to coat both sides of the steak in oil/garlic mixture, and then liberally sprinkle with steak seasoning before wrapping tight and letting sit. Depending on how pro-active I am, I either let it sit over night in the fridge, or if being made the same day, as long as I can before cooking. Trust me, this marinade will change your life! Now how do we cook this beautiful masterpiece? And yes, it can be done of stove top! After your steak has marinated, take it out of the fridge and set out on the countertop while you prep your pan. Use either a large frying pan, or large skillet, and place on med-high heat. Add a couple tablespoons of butter and let melt. 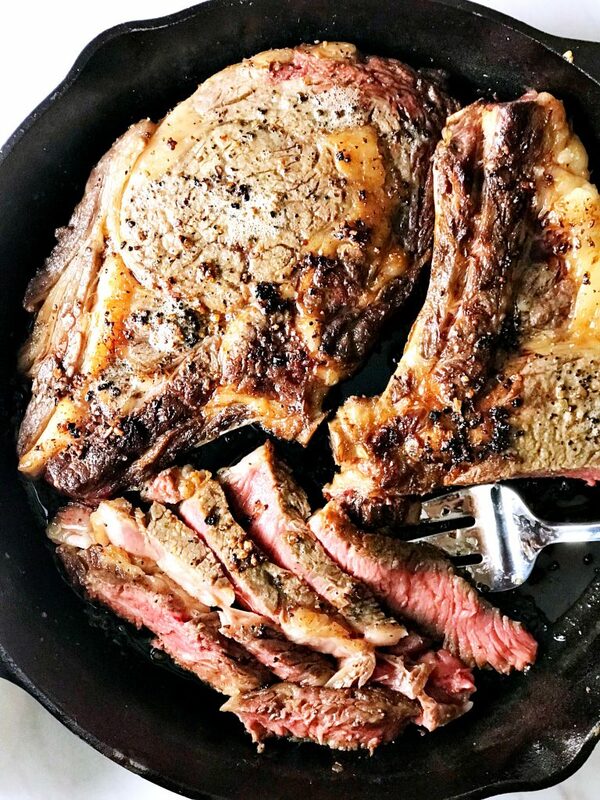 Once butter has melted, you will start searing your steak. Depending on how well done you like your steak, this can take anywhere from 7-15 min. I like my steak medium rare-medium, so I sear mine for about 10 min. To sear your steak, you will let it cook on high heat for a about one minute per side. After one minute has passed, flip to the other side and repeat until you’ve reached your desired temperature. Use tongs to flip your steak, and a spoon to pour melted butter and fat drippings over top while they cook. Prepare steak marinade by mixing together oil and garlic paste in a small bowl. 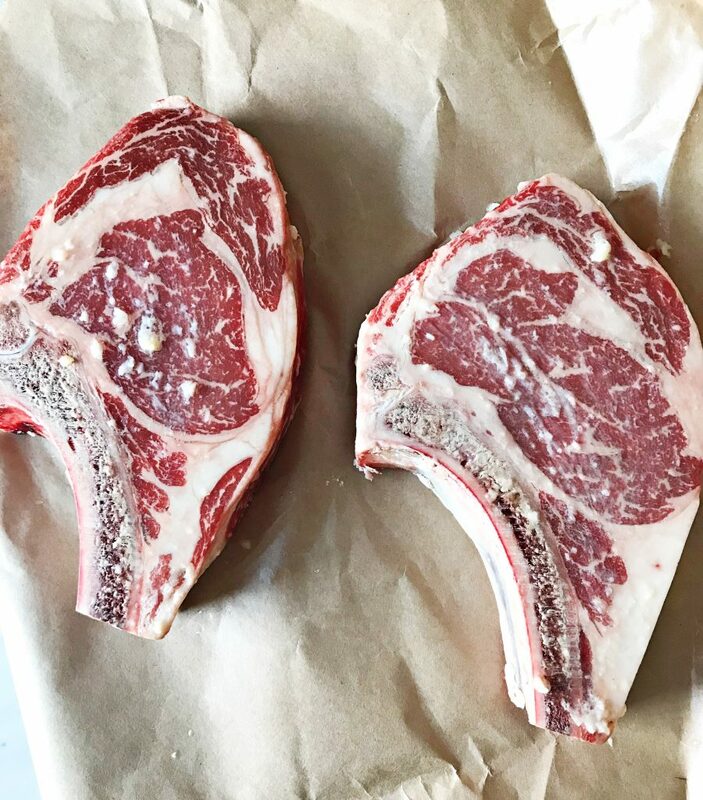 Brush over both sides of each ribeye. 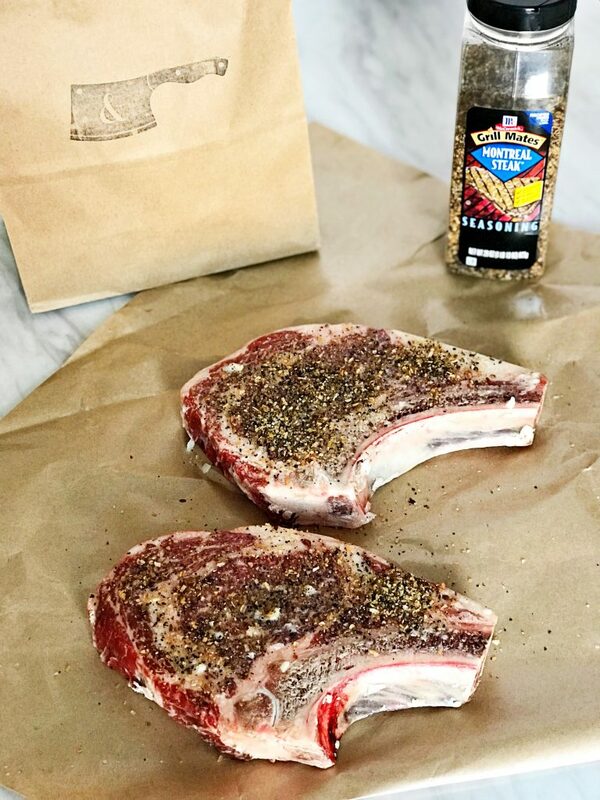 Cover both sides of ribeyes with Grill Mates Montreal Steak Seasoning. Wrap tightly and let marinate in fridge for a couple hours or overnight. Begin cooking right before serving. Heat a large pan or skillet over medium heat on stovetop. Add butter and let melt. 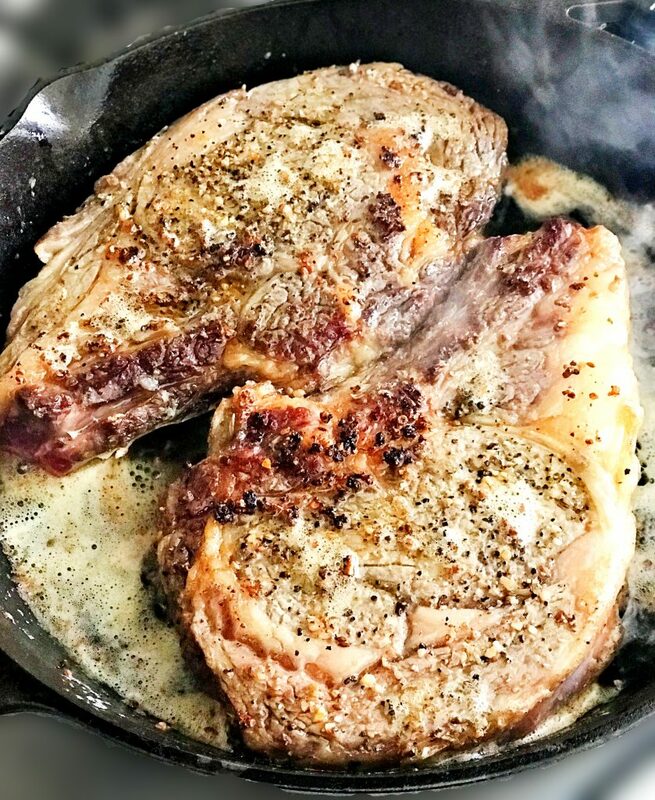 Once butter has melted, add ribeyes and sear 1 minute on one side, and then flip and sear 1 minute on the opposite side. Repeat process until desired temperature is met. This will take anywhere from 7-15 minutes depending on desired temp. As a reference point, for a medium steak cook for 10 min. 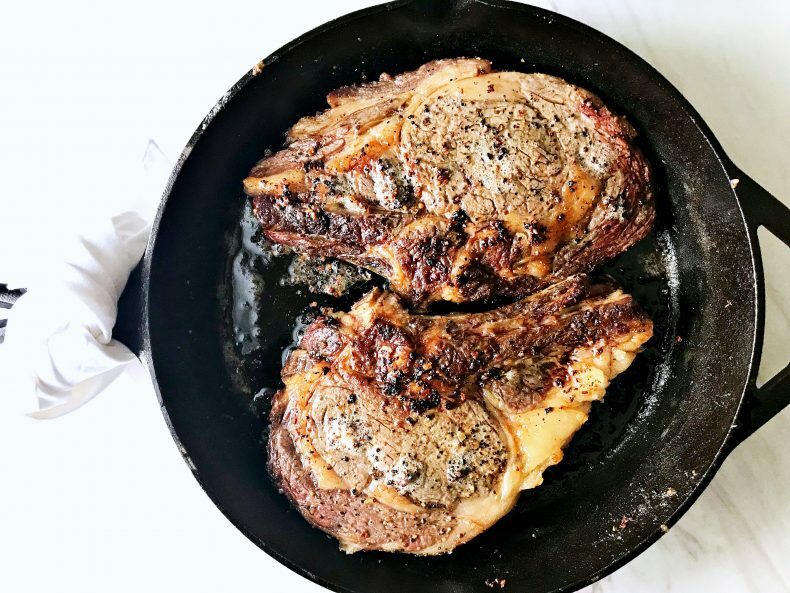 During periods of searing, take a spoon and scoop melted butter and fat drippings over top of ribeyes.